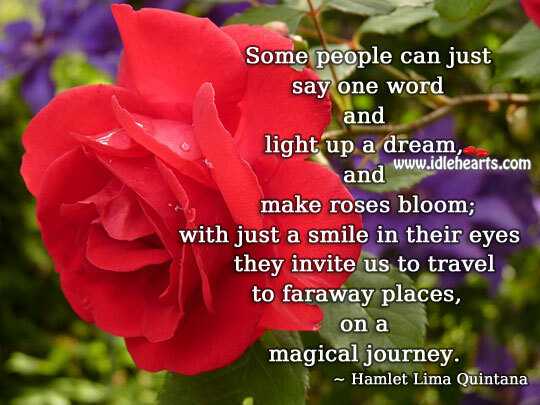 This is an image about 'Some people can just say one word and light up a dream' shared in Life Quotes category. Some people can just say one word and light up a dream, and make roses bloom; with just a smile in their eyes they invite us to travel to faraway places, on a magical journey. Some people, just by offering their hand shatter our solitude, set the table, serve homemade soup, and bring in flowers; just by holding a guitar they can create a friendly symphony. Some people, just by opening their mouth, can touch the far reaches of our soul, nourish the blossoms, invent dreams, make wine sing and make you fall in love with life.